Never underestimate the importance of naps while you travel. In the final hours of the weekend, we decided to head back to the F1 Hotel for a little nap before heading out to eat. Since the weather was still sputtering, it was nice to get into the air conditioned room for a little dream making. We decided to head down to Namupo (which literally translates into “wooden bowl”) before calling it a night. We had to wake up early the next day to catch the KTX back to Seoul, and we wanted to get a good night sleep. Lonely Planet’s Description: Not in a seafood mood? Try the galbi grills at this clean local favorite located in the city centre. There’s also a range of fan faces such as bibimbap and naengmyeon. (나무보; meals 7000W – 30000W; 10am – midnight). How to get there: Lonely Planet was right on the money. I wasn’t in the mood for seafood. I actually, rarely am, in the mood for seafood, so we decided to look this place up for our last meal in Mokpo. We checked on the map on page 222 and noticed it was located in shopping precinct on the Samillo (Street of Light), but if you head towards the train station, which also has a police station nearby, make a left and head into the shopping district. You really can’t miss it, because unlike the rest of Mokpo, it has fashion outlets, a bunch of franchise restaurants and in general, looks a little more cleaner. We walked in that area, found some nice shops, and eventually stumbled upon it. Dear gentle reader, this was before I decided to start this blog, and thus, my description and my memory has failed me. Next time when we venture to Mokpo, I will provide a more detailed description. Atmosphere: Shoes off! When the shoes come off, you know this place is going to be legit. We explained that my wife was pregnant, and that we didn’t want to sit on the floor, so they moved us back to the VIP section of the restaurant. Now, back there, something magical was happening. We had a whole table to ourselves, but next to us was some type of Godfather, Korean mafia gathering of adjosshis. We politely smiled and nodded, and they smiled and went back to their rambunctious laughter and yelling. Most people would hate this, but we love it! If you ever want to get a glimpse into the soul of Korea, go drinking or be around old Korean men who are on their way to getting hammered. You can tell locals are fond of this place because the menu was totally in Korean, and they were surprised that foreigners were in the restaurant. The table and chairs were standard, and the atmosphere was really lively; almost like a Korean diner circa 1950s with the saucy waitress included. 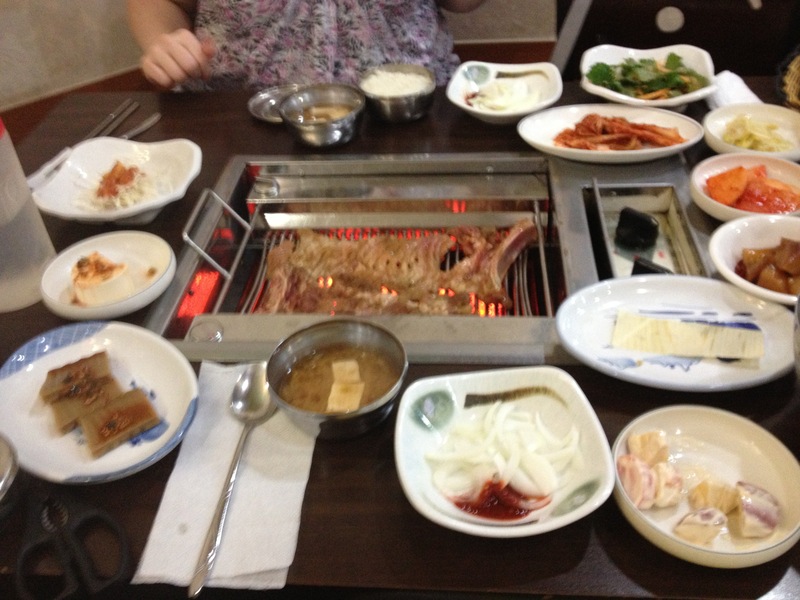 Food: We ordered the dwaeji galbi (돼지갈비), rice and mulnaengmyeon (물냉면) . For those who are reading this, and have no idea what that is, it’s marinaded pork, and cold noodles in an ice broth. Trust me, it tastes better than it sounds, especially in the hot Korean summer. The dwaeji galbi was fine, but I found the portions to be a little thin, but it was well marinaded and had good flavor. The mulnaengmyeon was great, it was nice and cool and it had that little hint of sour that contrasted nicely with the mustard sauce. It was nice and refreshing. The sides were okay. Pretty standard: Kimchi, that weird lettuce shreds with the hot sauce, onions and those weird jellies that taste like nothing. The one thing they did have was apples covered in a sweet, creamy blanche sauce that is awesome. We loved eating those, and got a second order. A couple of beers (for me and the baby… kidding!) and a cider for the wife. Value: Nothing that stood out in terms of value. We paid 11000WON for the dwaegi galbi and 5000WON for the mulnaengmyeon and the whole bill came to about 40000WON. We had to order three portions dwaegi galbi beside the portions were a little small. The mulnaengmyeon was great and the sides were fine. Maybe for Mokpo, this is an iconic place, a place that is legendary amongst the locals; but for me, it was just a regular BBQ joint. Honestly, it was nothing special. I could get the same food, with the same quality at any of my neighborhood places in Seoul. However, down in Mokpo, a town that is dominated by seafood restaurants, this place probably sticks out. Who should go there: People who hate seafood and are looking for a change. Also, people who want to experience Korea from a local perspective (there isn’t much foreign influence here).